Explanation: Walk through these doors and up the stairs to begin your journey along a line from Jaipur, India toward the North Celestial Pole. Such cosmic alignments abound in marvelous Indian observatories where the architecture itself allows astronomical measurements. The structures were built in Jaipur and other cities in the eighteenth century by the Maharaja Jai Singh II (1686-1743). Rising about 90 feet high, this stairway actually forms a shadow caster or gnomon, part of what is still perhaps the largest sundial on planet Earth. 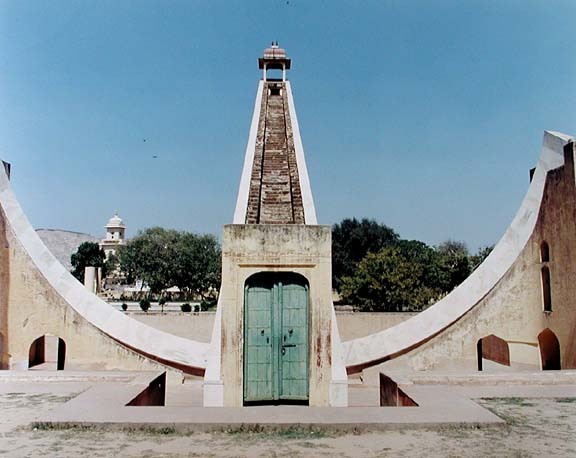 Testaments to Jai Singh II's passion for astronomy, the design and large scale of his observatories' structures still provide impressively accurate measurements of shadows and sightings of celestial angles.